What are micro-interactions and why are they important? The light switch in your living room, the soft-closing toilet seat in your bathroom, the sound your doorbell makes when your Deliveroo order arrives – what do all these things have in common? They are all micro-interactions. These are the little things you barely notice and certainly take for granted, but these small details can make a big difference to your day. In the digital world, you engage with micro-interactions everyday. With every login, like, comment or status, a micro-interaction is at work. Hell, even when you’re sat waiting for a page to load, there’s a micro-interaction at play. Micro-interactions help to make products, services and interfaces more approachable and easier to deal with. Your toaster pops the toast up when it’s done to let you know its ready – that’s a micro-interaction. Micro-interactions provide feedback and give further understanding to processes, as well as allowing the results of actions to be visualised or heard. They are an excellent way to add some personality to your interface and have some fun with your users. When micro-interactions are done right, they can give a user positive feelings about your brand and influence their actions, often without the user ever realising why. Triggers are the user’s actions that start the micro-interaction (pushing the lever down on the toaster), rules determine when something will happen (when the toast is toasted), and feedback notifies the user of what is going on (toast popping-up). One of the best uses of micro-interactions is to add some personality to your interface. 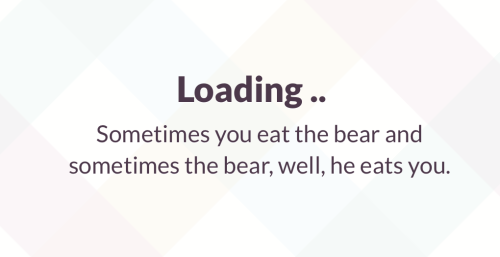 Whether it is a cute graphic or a joke while something is loading, micro-interactions can go a long way towards making the user have positive feelings towards your brand. Want the user to do something? Micro-interactions are your new best friend. Whether you want the user to add something to their basket or simply like a photo, you can use micro-interactions to stimulate their behaviour. Forming habits ensures that users spend more time in an app or on a website. Micro-interactions can build habits through using repeated cues, routines and rewards. Facebook and Instagram are masters of this–millions of people spend every idle moment updating their feeds for that hit of dopamine that comes when someone likes their photo. Micro-interactions can be used to indicate state changes or new developments, such as Facebook notifications. They can also provide context, improve navigation, and reduce confusion for users when dealing with uncommon layouts. When micro-interactions are done right, they can make all the difference to your users’ experience. The old cliché, ‘It’s the little things that matter’ is certainly true when it comes to interfaces. These small touches can have huge impacts on the way users feel about your app, your website, or even your brand. With the right micro-interactions, you can influence their actions towards your own goals. Have a chat to us at hello@mallardandclaret.com to find out what well-planned micro-interactions can do for your business.